Sub. 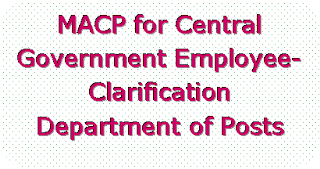 : Modified Assured Career Progression Scheme for the Central Government Employee - clarification regarding. I am directed to forward herewith the copies of Ministry of Personnel, Public Grievances and Pensions, Department of Personnel & Training Office Memorandum No.35034/3/2008-Estt(D)(Vol.II) dated 4th July,2017 on the subjects cited above and as downloaded from the official website of Ministry of Personnel, Public Grievances and Pensions, Department of Personnel & Training, for kind information and further necessary action at your end. 2. Office Memorandum may be circulated to all sub-ordinate offices concerned, with direction to dispose all case on the subjects.